There are two genres of historical film costuming: the accurate and the artistic. To judge either type by the other's standards results in dissatisfaction - very accurate costumes that are truly representative of their era will frequently be unattractive or awkward to a modern eye, while very stylized costumes can frustrate a viewer who was hoping to see lavish reproductions for a particular era. But both options have equal advantages: with the latitude to use modern influences, a costume designer can speak more clearly to a modern audience, and with more strict standards of authenticity they can give an impression that the characters have stepped directly out of the past. While you can criticize an artistically costumed movie for inaccuracy or an accuracy-focused production for being odd-looking or for wasting too much time on details, to concentrate entirely on those qualities is to ignore a full picture of what was attempted. But there's a wrinkle in the story that generally isn't talked about: the 1920s may be the most stereotyped modern era, and therefore the most difficult to represent to a contemporary audience. 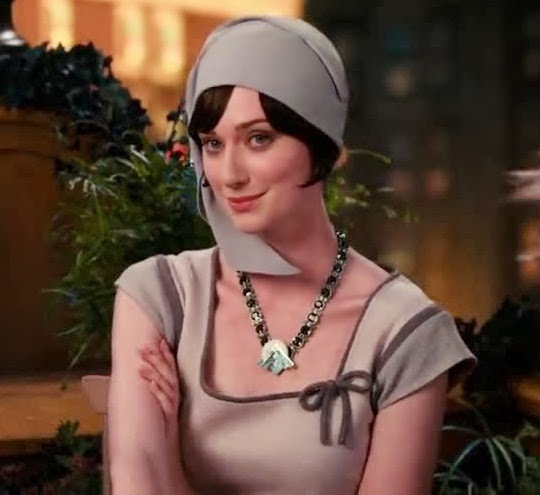 It's been mentioned that actors are dressed more for the later '20s rather than 1922, when the book was set - but to me, it seems impossible to set a film about the dissipation of the Jazz Age so early in the decade in a way that could satisfy an audience. As you can see from many of my posts on the 1920s, what is accepted about the decade - even by academics and people who have done some research - is generally only true, when it is true, about a small portion of it, perhaps 1925-1927. One that I haven't written about very much is the appearance of the bob: the Louise Brooks style, smooth and close to the head, was not actually seen that frequently on women in the 1920s (more usual was a frizzy, wavy mass of hair), yet it has become the way nearly every bob onscreen is portrayed. That is what we see as attractive, so that is what we accept onscreen. It also fits with that stereotyped narrative about the '20s, that the world suddenly changed in 1920 and everything of the past was jettisoned, replaced with sleek, shining modernity. At the same time, we see a paradoxical combination of innocence and sensuality in the decade, in that we envision the men and women of the time engaging in transgressive behavior for the sheer joy of it, and an innocence of what would happen to this hedonistic, joyful world after the crash of the stock market. While a person around or after 1925 seems prescient and wise for realizing that the pursuit of fleeting physical pleasure is meaningless and leads to dissatisfaction and unhappiness, it would be much more difficult to reconcile this sort of world-weariness (not to mention the sexiness) with a setting that appears so much more old-fashioned and naive. The way that countless films have depicted the 1920s have all but replaced the real 1920s in the public imagination, seeming more like the decade of drinking, bootlegging, violence, and sin than the reality of it does. As Granny Weatherwax says in Terry Pratchett's Wyrd Sisters, "Things that try to look like things often do look more like things than things." So, what about the actual costumes from the movie? First of all, from reading interviews with Catherine Martin, the costume designer, it's clear that a lack of research or understanding of the period is not an issue. My overall opinion is that the artistic aspect of the costumes clearly took precedence over their accuracy, and that that to a certain extent helped Martin retain some aspects of accuracy by her avoidance of stereotype. Daisy is the central female character in the story, and it is her clothing that is the most criticized for inaccuracy. 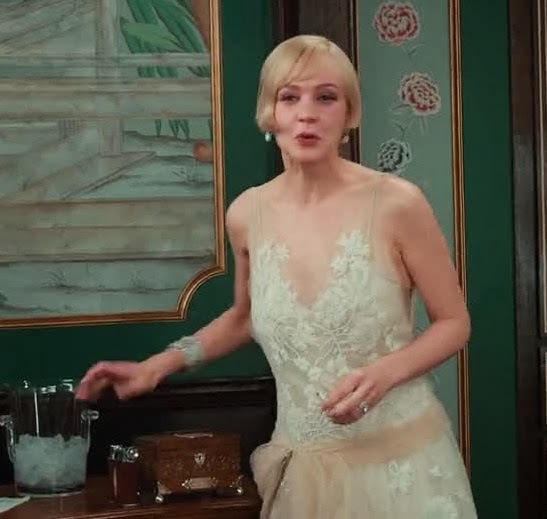 Carey Mulligan's costumes are generally romantic and soft, very far from the typical image of the streamlined, short 1920s dress - however, in their departure from this stereotype, her dresses approach authenticity in their fussiness and the amount of embellishment, while also conveying aspects of her character: her old-fashioned viewpoint on marriage and social class, as well as her ethereal nature. And while her long skirts appear to the viewer used to 1920s costuming as anachronistic holdovers from the 1910s, not right for the fashionable Daisy, below-the-knee skirt lengths were only the height of fashion from late 1924 to 1928. As with many of the costumes designed for the film, her look can be seen as cutting-edge, more related to the end of the decade than the middle of it, but also totally appropriate for 1922. Much has been made over the tightness of the dresses and Mulligan's probable foundation garments. 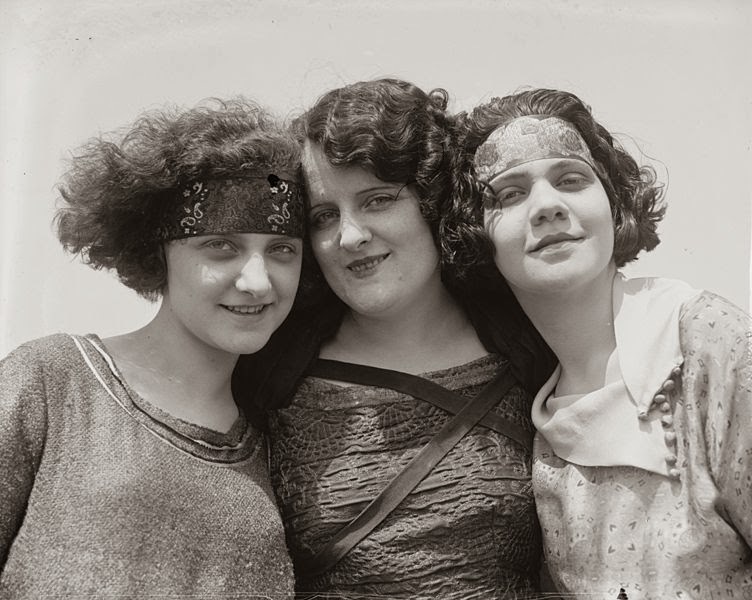 The former, yes, is most likely due to modern sensibilities about what makes bodies and clothing attractive (although tight clothing in the 1920s did exist, as did defined busts), but the latter is not actually an issue, corsets, girdles, and brassieres being worn in order to achieve the fashionable figure. The purple "floating nun" hat, in my opinion, is one of the best weddings of artisticness and accuracy in the whole movie. That particular historical style is very under-represented in film, which generally chooses to dress all women in brimless cloches - Martin uses them as well, but hers are mainly spectacular shaped felt numbers like this one by Miss Fox. On the other end of the scale are Myrtle and her friends: boozy, flirtatious, promiscuous. Myrtle's look in particular seems to be strongly influenced by Clara Bow, with her fluffy bob, bow lips, and scarf. There's no excuse at all accuracy-wise for Isla Fisher's dramatic cleavage, but what all of these dresses remind me most of are costumes from a Broadway musical, like How to Succeed in Business ... - eye-searing colors, one base color per actor, and very large details (buttons, edging, jewelry, belts, etc.) to be seen by the audience from a distance. In Gatsby, it helps to differentiate the Queens characters from those in West and East Egg, who live in entirely separate worlds. 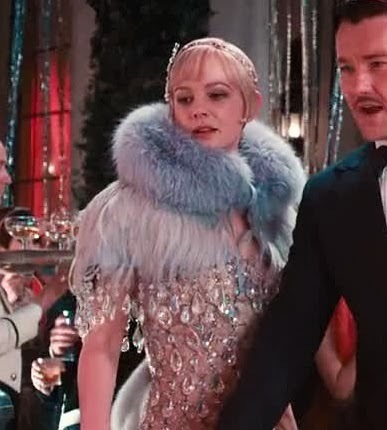 Even when Gatsby is throwing vulgar, excessive parties, the color schemes are metallic and dark (except for the showgirls and performers, who are likely from the same social class as Myrtle). So, I must depart from the general opinion and say that I consider the film's costuming to be excellent, and more accurate than Catherine Martin is given credit for. In some ways, I prefer the mix of accuracy and imagination in The Great Gatsby to a film or show that attempts accuracy but is repeatedly off on details. Great post, Cassidy. I'd like to read some more of your movie costuming assessments. Maybe your take on Anna Karenina, or on some BBC series' set in the past, or on The Lady and the Highwayman. Thanks! I felt a bit bad afterward because I really meant to go into more of the costumes, but I'd already written quite a bit. I should do Anna Karenina - I remember really liking those costumes. Really great, I love movie costume analyses! Besides, this one made me realize how little I know about the 1920s and that there are styles I actually like (in contrast to the "typical" evening wear style). Thank you! The 1920s are fascinating, there's so much to be explored that is generally not. Downton Abbey actually has been disappointing me a bit (ever since the second season) because they've sort of skimmed over the whole fussy, full-skirted late teens-early '20s era. The showgirls in the above cap were pretty explicit nods to the Dolly Sisters! As soon as I saw their headpieces I was like "That's supposed to be them!"